What do you remember about the geology section of your middle-school science classes? Do you remember learning about fault lines and subduction zones and the theory of plate tectonics? If you do, you'll remember learning about how the earth's crust is actually made up of gigantic slabs of floating rock known as tectonic plates. There are seven major plates and then a handful of smaller ones that grind and bump up against each other, often causing things like earthquakes to shake, mountains to grow, and volcanoes to erupt. Most of these meetings of plates happen beneath mountain ranges, or in the depths of the ocean – other than feeling the earthquakes or seeing a plume of ash go up from a volcano, we don't SEE a lot of what happens between the earth's tectonic plates. Except if you go to Iceland. 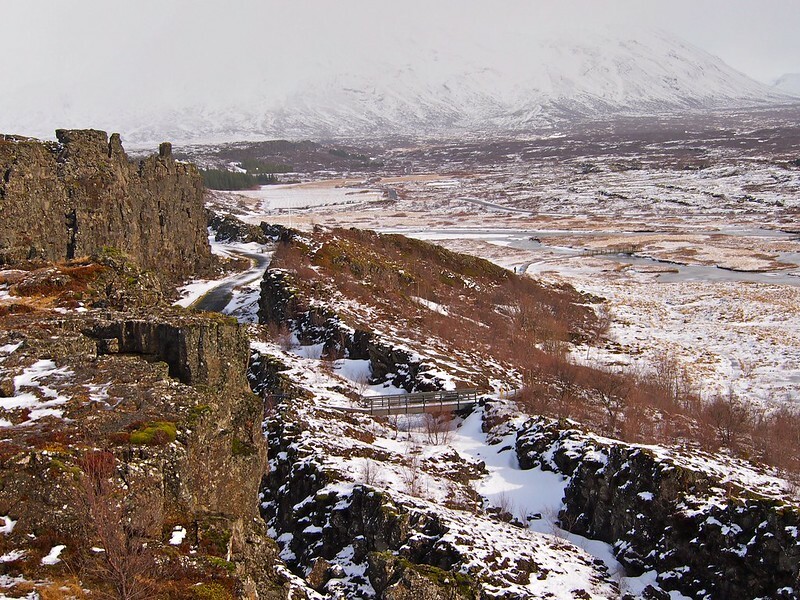 In Iceland's Þingvellir National Park, you can get up close and personal to two of Earth's largest tectonic plates. Here, the North American and Eurasian plates are slowly drifting apart from one another, up to 2 centimeters per year. This type of plate interaction is scientifically known as a divergent boundary, and there are only TWO places in the world where you can see separating plates like this with the naked eye: here in Iceland, and in the Great Rift Valley in Africa. 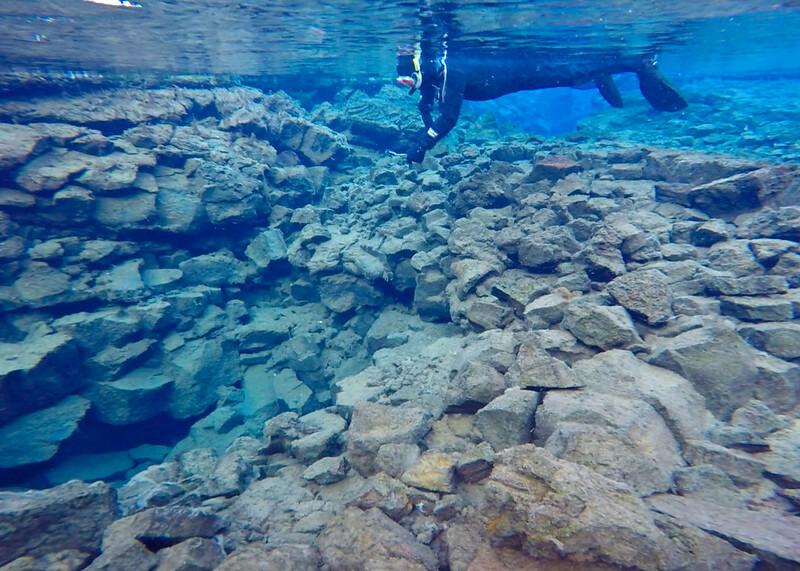 But in Iceland, part of the rift caused by the separation of the plates has been filled in by a large lake called Þingvallavatn – and you can snorkel/dive between the plates. 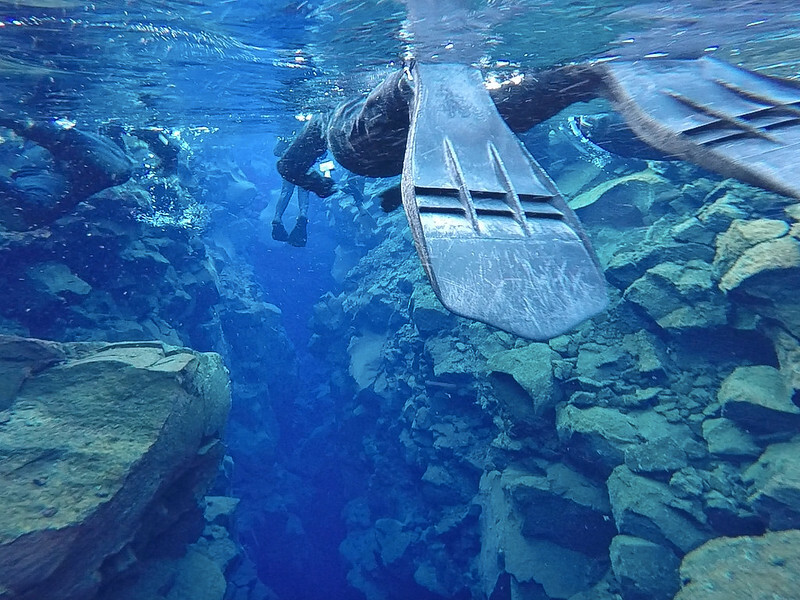 That's right, guys: YOU CAN SWIM BETWEEN TECTONIC PLATES IN ICELAND. If this doesn't make Iceland one of the coolest place in the world, I'm not sure what would. The plate boundary bisecting Iceland is mostly responsible for the country's abundance of volcanoes and geothermal activity. But in Þingvellir, the plates look and seem pretty tame. In fact, they are tame enough that multiple tour companies take dozens of tourists to splash about in between them each and every day. Now, *could* the plates suddenly shift and molten lava bubble up between them? Well, I suppose anything is possible in the Land of Fire and Ice. But the chance is slim at this type of plate boundary. You would be more likely to experience an earthquake, which really wouldn't affect you much in the water. But back to that snorkeling. I missed out on snorkeling Silfra (that's the name given to the tectonic rift) on my first trip to Iceland, and decided to make it one of the first things I booked for my second trip. I decided to drag Elliot along, too – and, bless him, he actually went with me, despite his hatred of being cold. Because, you see, we were in Iceland in November, when the air temperature was just below freezing and the water temperature in Silfra was roughly 37 degrees F. Granted, the water is cold year-round. But the snow on the ground certainly made the whole thing LOOK a whole lot more badass and/or insane. 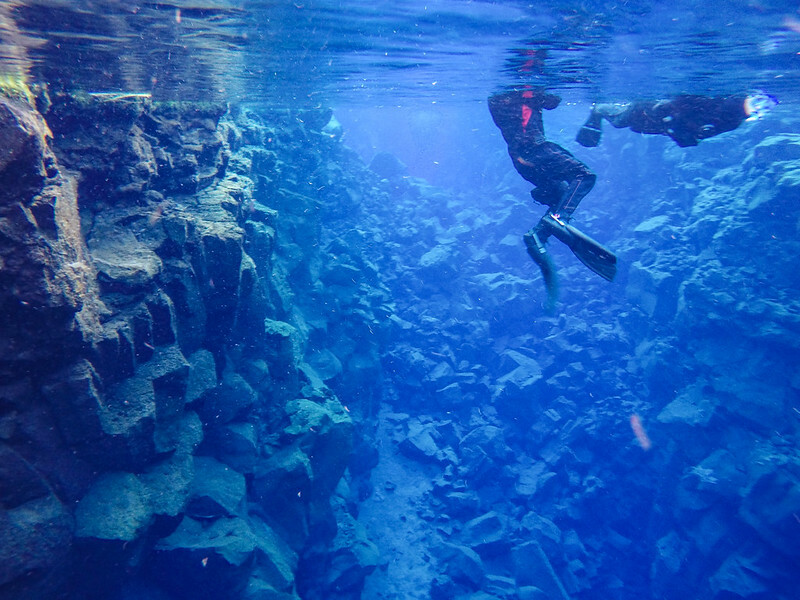 We booked our tour with , which is a company that comes highly recommended when it comes to snorkeling Silfra. They picked us up from our apartment in Reykjavik and drove us the 45 minutes to Þingellir. Then it was time to get geared up. Since the water in Silfra is so cold, most of the tour companies provide you with a dry suit to help keep you warm (and, you know, dry). Getting into this suit is an entire process in and of itself, and I'm pretty sure it took longer to get geared up than it did to actually snorkel the rift. The first step to getting into a dry suit is to strip down to your long johns and then zip into a quilted onesie. Then you put on the heavy dry suit itself, complete with constricting wrist cuffs and a neckline that makes you feel like you're being birthed when you shove your head through it. It's all in the name of (hopefully) staying dry, though. Next come gloves, a hood, flippers, and a mask/snorkel. And then you all waddle out to Silfra itself and slowly start getting into the water. It's ALL worth it, though. In fact, I'm pretty sure it's impossible to stick your face into the water in Silfra and NOT immediately gasp in awe (and cold, but mostly in awe). You won't see much (or any) marine life here, but that's okay because it's not the point. 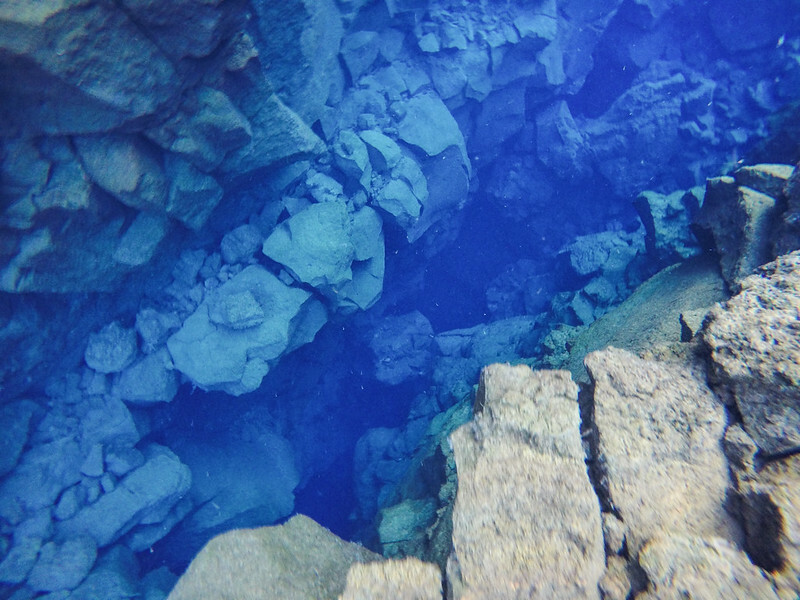 The real showstopper at Silfra is the color and clarity of the water – crystal clear and a deep, rich blue. The hues of blue change depending on the depth of the rift – sometimes you're swimming in water that's only a few feet deep, while other times you're floating over deep pools. And, always, the tectonic plates are surrounding you. All in all, we spent just over half an hour swimming around in Silfra. Our guide took us from the Big Crack to Silfra Cathedral to Silfra Lagoon, moving slowly and making sure everyone had enough time to take it all in. He also encouraged us to drink the water – since the water in the lake comes from nearby glaciers and is filtered down through lava rock, it's incredibly clean (hence why it's also so clear). It's basically like it came down through a giant Brita filter. And it tastes pretty damn good! This isn't something that will appeal to everyone (heavy gear, cold water, and all that), but if you love snorkeling and really unique adventure activities in random corners of the world, then snorkeling Silfra is definitely for you. 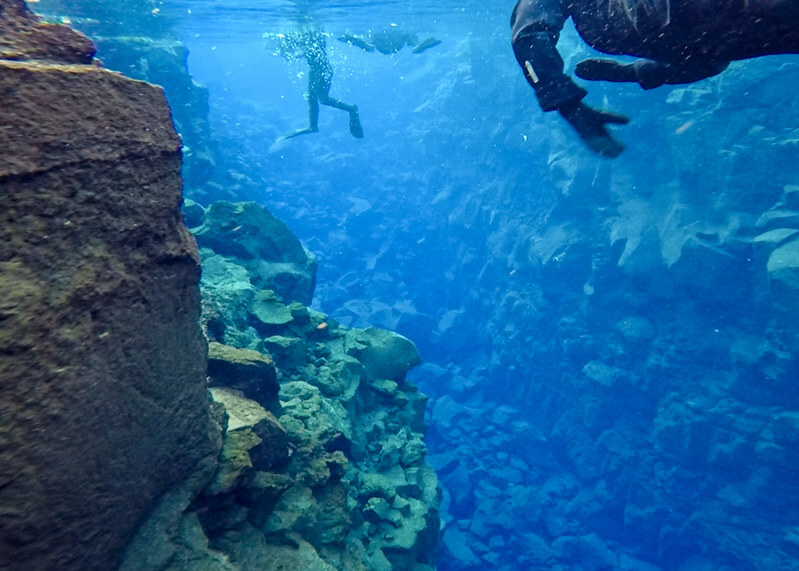 And, if you're a certified diver, you can dive Silfra, too! WHO: We went with DIVE.is on their and have only great things to say about them. WHEN: Tours run at least once daily in the winter, and twice-daily in the summer. HOW LONG: Plan to be gone at least 4-5 hours. If you've planned another tour that day, be sure to let your guides know. 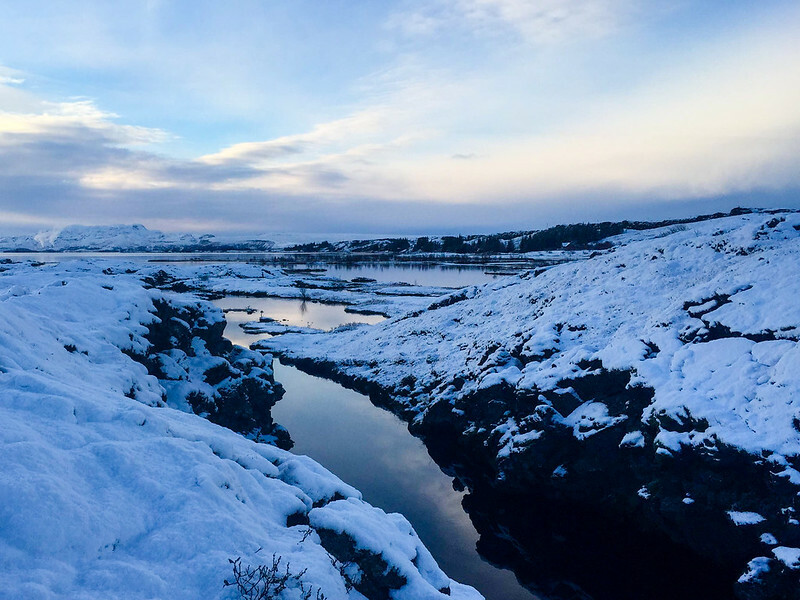 HOW MUCH: ISK 16,990 ($130 USD) per person if you have a car and can meet the guides at Þingvellir; ISK 20,990.00 ($160 USD) if you also want pick-up/drop-off in Reykjavik (note: not all tours offer pick-up, so make sure to check when booking!). 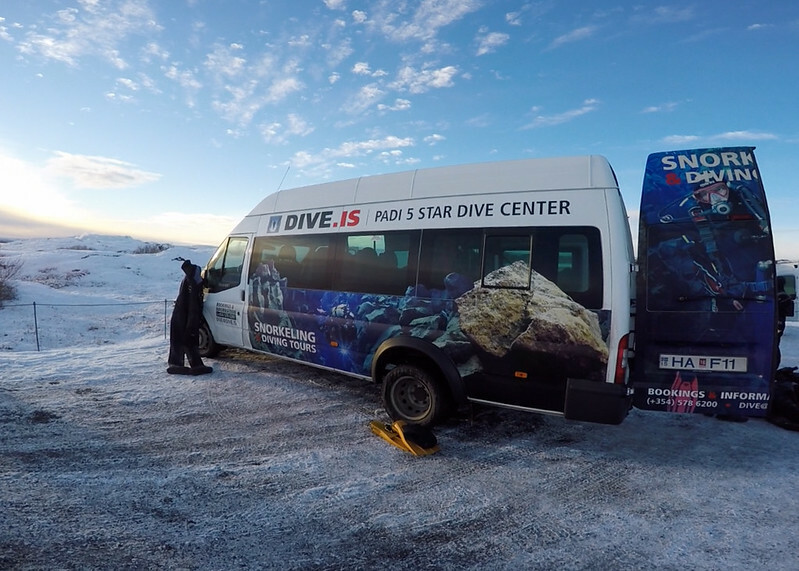 WHAT'S INCLUDED: Transfer to/from Silfra (if you paid for it), dry suit and all snorkeling gear, certified guides, hot chocolate and cookies after your trip. WHAT TO BRING: They suggest wearing long underwear and two pairs of warm socks inside your dry suit. I also recommend bringing a change of clothes and some warm layers for afterwards – juuuust in case you get a little wet like I did. You also may want to bring some snacks, since you'll be gone for a while and expending quite a bit of energy! Is this something YOU would try in Iceland? 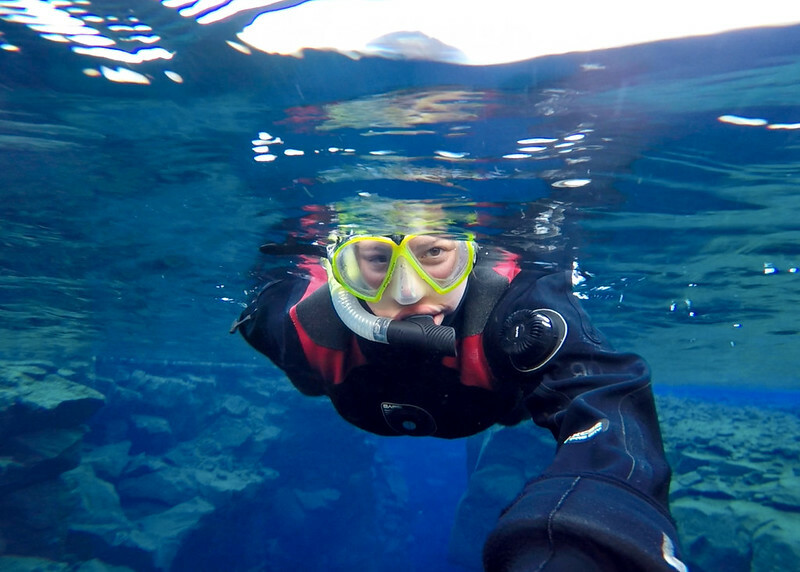 I looooved snorkeling in Silfra! Sure, my face was cold, but I didn’t even think about it once I was in the fissure, admiring it all. What a wonderful experience it was. I want to do this sooo bad! Seems like tourism in Iceland has exploded since I was there (2005) and I would love to go back. PS: I love glacier water, so yum! That looks amazing. I’d love to try it! Looking forward to Iceland next summer and this is definitively something I’ll try to get done. Add it to that list! Iceland in summer should be great. It was! A bit chilly, sure, but also so worth it. YES! It’s so random and unique – I’m so glad I finally got to do it! I’ve been reading so much about Silfra and I would love to check it out for myself. I can’t imagine what it would feel like submerging yourself in such cold water! I’m really hoping that I’ll get a chance to explore Iceland this year! The cold water part isn’t nearly as bad as you would think! 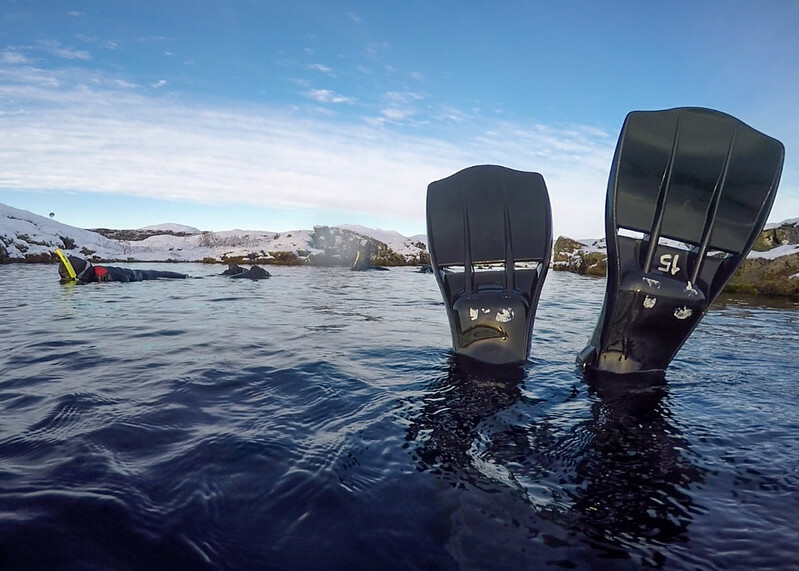 Partially because the dry suits are really good, and partly because it’s just so darn cool that it’s easy to forget about the cold for a while. I’ve been wanting to do this dive pretty much forever! Not gonna lie, though, the cold certainly dissuades me a little bit. I wonder if you do it in the height of summer, say June or July, if it helps at all? Wow! As a kayaker, I always said I would do anything that required a dry suit…but I just might make an exception for this – pretty amazing! In my opinion, it’s worth making an exception for! That is an experience! I’ve mentioned in another comment that I would probably get Iceland onto my travel wishlist, but now I definitely need to get there. I actually want to book a trip there and I’m interested to know how much money to try and get for that. Iceland can be a bit pricey. Flights from Europe are really affordable (there are a few budget airlines that fly there), but activities, accommodation, and food can be really expensive! How much you’ll spend depends on how long you’ll be there and what you’re going to do. You could rent a car and camp the whole trip, which would cut down on some of your expenses – but I know that’s not for everyone, and also only works in the summer! I can imagine that in the winter in freezing down there, even with the best clothes and sleeping bags. But can you find some cheap accommodations in Reykjavik during the summer ? I imagine that during the winter there aren’t as many tourists as in the summer, with all the night out there, and maybe the prices are lower. Reykjavik does have some hostels, so there are budget options year-round. And in the summer you could definitely camp/rent a campervan! This is so high on my bucket list for Iceland! What an amazing experience – and what fabulous photos! Thank you! And yes, it was pretty amazing! 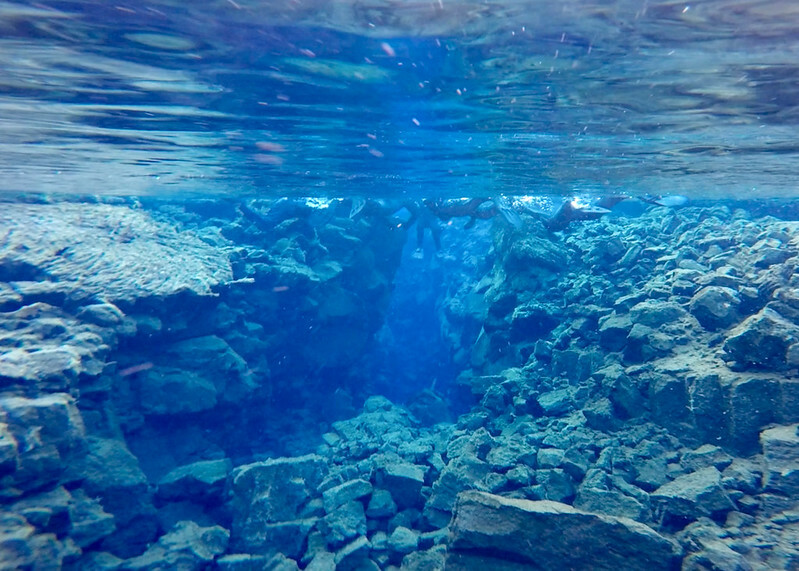 I really love your post about the snorkeling between the two tectonically plates. Unfortunately we didn’t manage to do it during our stay in Iceland, but it’s absolutely on my bucket list! You’ll just have to go back to Iceland again! I love your post! I had a question about the video and pictures you took. What kind of device were you using? Camera? Phone? Thanks for sharing! I’m going in a few months and want to get some pictures of Silfra like this! I used a GoPro! (I have the Hero 4 Silver.) Many of the photos are actually just screenshots from the video I took, since taking underwater photos is tough, especially when you’re wearing clunky neoprene gloves to keep your fingers from freezing off! Ah I see! That is one of the things I’m worried about… taking pictures with the gloves buuuuut your idea of the screenshots from the video is genius! Did you have any issues with the Go Pro in the cold water? Did you use any type of filter to get the clarity/blueness captured? And one last question, did you use any type of special strap to keep it in place or did you just hold it in your gloves/hands? Thanks so much! I’m super excited! Yeah, taking photos with those gloves is tough, and would be impossible with an iPhone in a waterproof case. But a GoPro is a great option! I didn’t use any type of filter – the water is just that clear and blue naturally! And I just had it on a floaty stick and was fine holding it like that. The battery did suffer a bit in such cold conditions, but I was also there in the winter when it was cold outside as well as in the water. 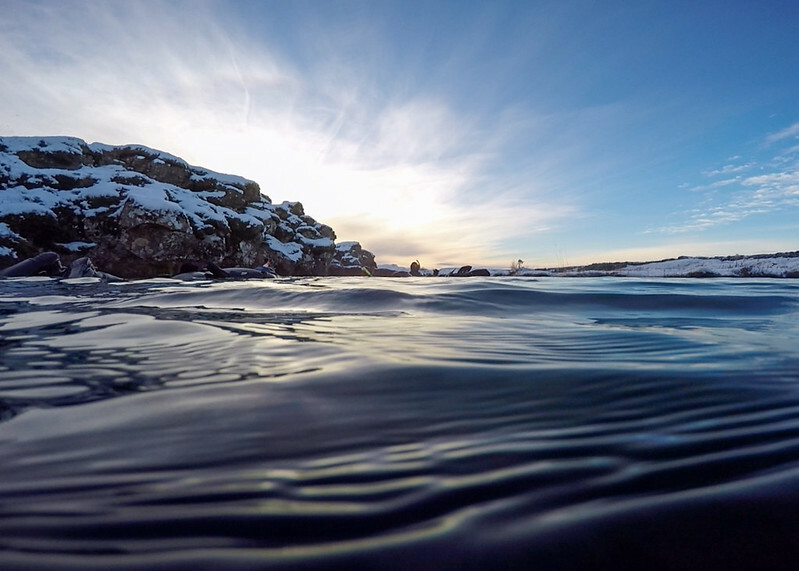 If you’re there in winter, I recommend keeping the GoPro somewhere warm the entire time you’re gearing up, and then tucking it under your arm as you walk to the water to save the battery as much as you can. This is probably the number one thing on my bucket list! 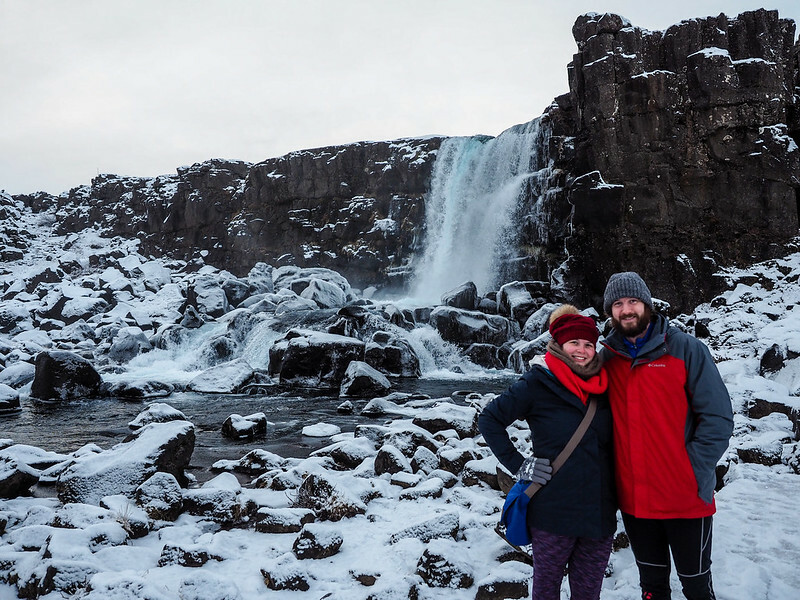 We can’t wait to go to Iceland one day (just soon far away when you live in the southern hemisphere!) 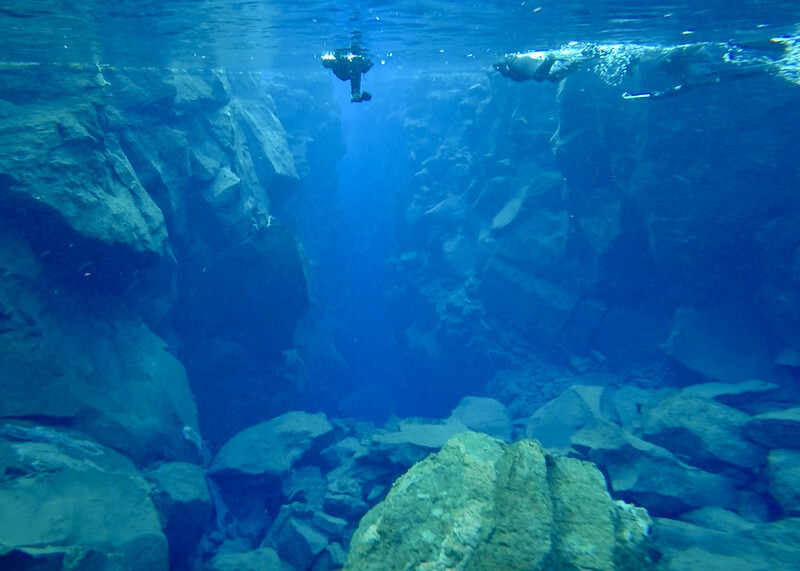 and scuba diving Silfra will be the first thing we do! 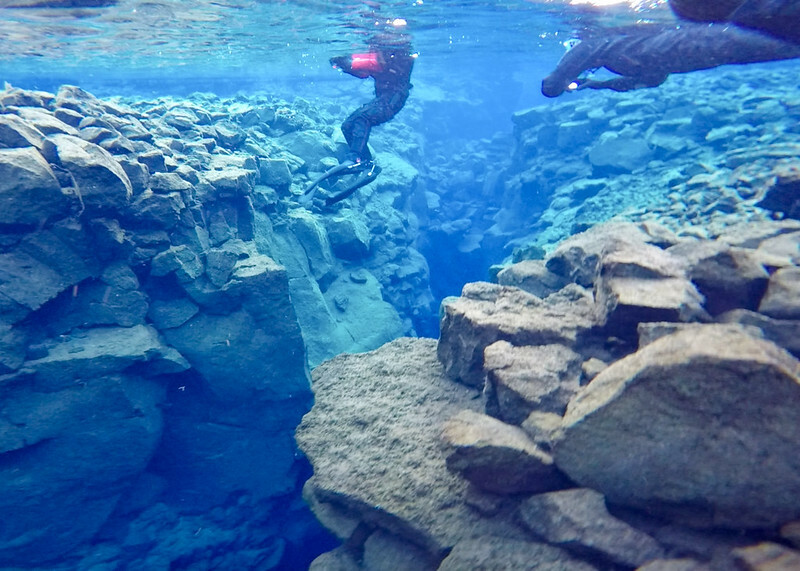 It’s definitely worth it – not just Silfra, but all of Iceland! The water definitely IS cold, so it really depends on how your body deals with that. I’d say it’s still worth it, though – it’s such a unique and cool experience! I did this last week – wouldn’t even have known about it without reading your blog! The only problem for me was that it was my first time snorkeling, so by the time I’d got used to it we were halfway through – guess I’ll just have to go back and do it again! And for someone who usually struggles with the cold, I have to say it wasn’t as bad as I’d expected. Awesome to hear, Sarah! I’m glad to hear it wasn’t as cold as you thought it would be! Wow – this looks super cool! My husband and I are planning to go in November, but haven’t booked the tour yet. I do have one question, do I need to worry about floating? I am comfortable in the water as long as I know a floating device can help me float. If I don’t have it, there’s a high probability I will panic. Does the dry suit make you float? Hi Akatuki, I am a big supporter of Full Face Snorkel masks these days. Do you think these would be suitable for the sort of snorkeling you are doing in Iceland? A bit concerned about the water being so cold, but I guess as long as you are prepared for it in advance, it shouldn’t be a problem. BTW beautiful pictures that really capture the moments. All the gear is provided for you on this excursion, so you would need to the company if you wanted to bring your own snorkel gear (I guess you’d just have to make sure it would work with the dry suits you wear!). The water was pretty cold on face and hands, but not terrible in my opinion! 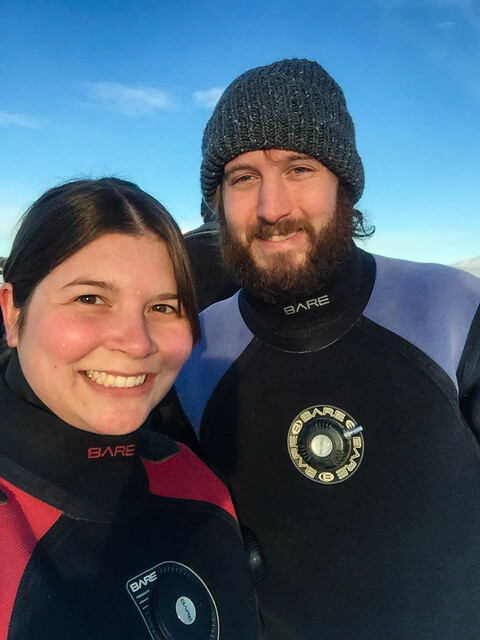 I went in October and my husband and I snorkelled Silfra in wetsuits. Yes it was freezing cold, but we could free dove down under the water. We were the only couple in our group who were in wetsuits and the guides did question whether we were sure. I didn’t manage to free dive well, but would have felt gutted if I hadn’t given it a good go. My husband enjoying swimming under everyone in their dry suits! Fantastic holiday!